✅ FOOD AS MEDICINE: The Governor THE ONE AND ONLY IN THE WORLD! Tempt your palate and nourish your body with our extra virgin olive oil that's packed with polyphenols that guard against chronic diseases and help you live your best life. 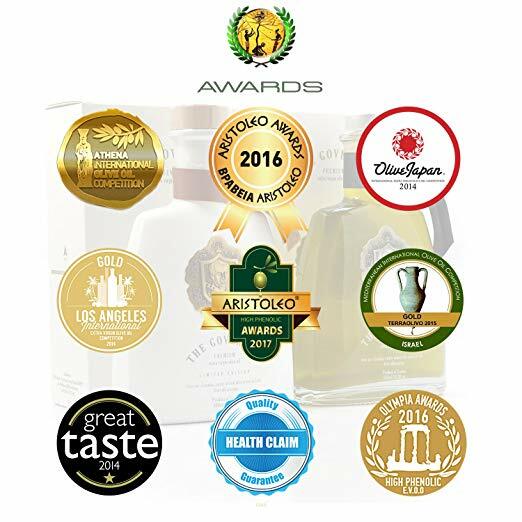 ✅ MADE AS NATURE INTENDED: This cold-pressed olive oil, teeming with olive oil polyphenols, is processed in a manner that preserves the exquisite flavors and health-giving properties of this rich elixir of life, ultra-premium "LIMITED EDITION" unfiltered olive oil like none you have tasted. ✅ THE LOOK OF QUALITY: The elegant 500ml white glass bottle, which holds this limited edition cold-pressed olive oil, reflects the uncompromising quality that stands behind our premium product. (Packaged entirely by hand). - ORIGIN: The fresh wind of the Ionian Sea keeps the Governor healthy and fruitful year after year. - Imported from Corfu island Greece.